My three-year-old daughter loves to draw and has a ridiculous collection of all sorts of crayons and pencils and textas. Not to mention her favourite glittery glue sticks, her “best” scented markers and her special zigzag scissors. While I’m all for encouraging creativity, I’m not so fond of the way those art things seem to end up scattered all over the house. So here’s the perfect little something to keep her craft fetish under control. The Kids Kitchen Craft Turntable is a super-sweet way to keep everything sorted so mini artists can spend more time creating fun crafts and less time looking for that favourite crayon that went walkabout last week. 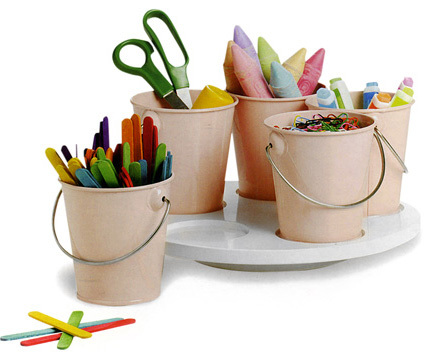 Five darling metal buckets with teeny-tiny handles are the perfect size for holding tons of pencils, markers and whatever else your budding Picasso has on hand. The buckets easily lift off from the base for solo colouring projects and the wooden turntable spins for easy sharing with siblings too. 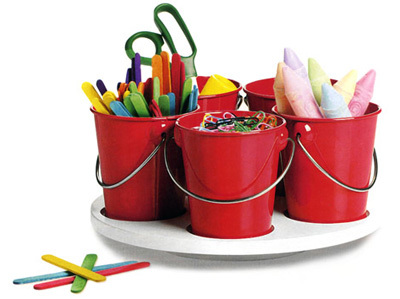 You can fill the buckets with beads, sequins, feathers and other frippery for making collages. 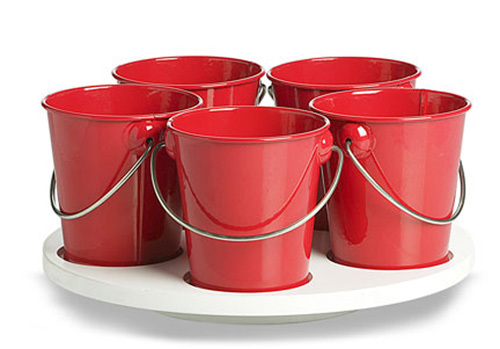 Or try this – before loading ours with pencils and pastels, I commandeered it for my son’s circus-themed first birthday party last week and filled the buckets with all sorts of yummy lollies! Grab your own Kids Kitchen Craft Turntable from the delightful Urban Baby for $29.95 plus delivery. They have a pale pink version too. You’ll find both colours in their `New at Urban Baby’ section. Make sure to mark down your favourite on your wish list while entering our competition this month to win a $1000 Urban Baby shopping spree!